Meander through the tidy, flower-lined streets of this pedestrian-friendly village to view the Danish architecture and large European style windmills, a clock tower plus statues of Hans Christian Andersen and the Little Mermaid fountain. You can spend a peaceful day strolling the streets of Solvang. Start your day with breakfast at an authentic Danish restaurant or bakery. 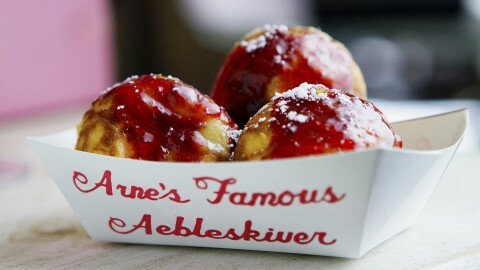 Don't miss the popular aebleskiver-deliciously light and airy Danish pancake balls dusted with powdered sugar and served with raspberry jam. Take a stroll around the pedestrian-friendly village enjoy picturesque architecture including several windmills, a clock tower that plays seasonal tunes plus statues of Hans Christian Andersen and the Little Mermaid. Be sure to look for ornamental storks perched on roofs-they are considered good luck in Denmark and Solvang! Savor a smorgaasbord to taste frikadeller (meatballs), medisterpolse (sausage), and other Danish favorites for lunch. A shopper's paradise, Solvang's streets are filled with more than 150 stores offering unique treasures, handmade lace, music boxes, clocks, jewelry, porcelain, Danish arts and crafts. To learn more about Solvang's history, visit the Elverhøj Museum of History & Art with its delightfully decorated period rooms, the Hans Christian Andersen Museum, the Solvang Vintage Motorcycle Museum, or the national historic landmark 1804 Old Mission Santa Inés. Wine and dine your way through the village with a variety of cuisines to choose - from Danish of course, to Italian, Chinese and gourmet California wine country fare. There are more than a dozen wine tasting rooms downtown (segments of the Oscar-winning movie Sideways were filmed in Solvang), so be sure to sample some of the local wines. In the summer, take in a performance at the acclaimed PCPA Pacific Conservatory Theater outdoor theatre. Stay, play and relax in the California's "Little Denmark."